Can anyone explain me how it works ? Consider a noisy target, , for generating the data, where is a noise term with zero mean and variance, independently generated for every example . The expected error of the best possible linear fit to this target is thus . In-sample error vector, , can be expressed as , which is simply, hat matrix, , times, error vector, . Well all fits now, just my mind played a game to me. Thank you for the question and the answer. Why the last statement is 0? I don't quite understand. Does the mean being zero imply E(e_i) and E(e_j) = 0? I find it weird if that is the case. Because that will mean E(e_i) = 0 but E(e_i^2) = \sigma^2. 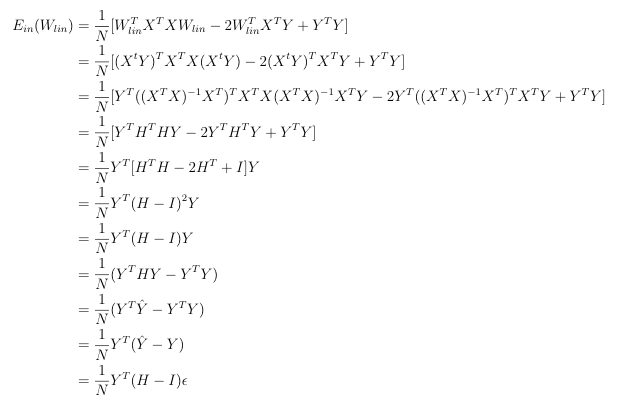 I understand E(e_i^2) = \sigma^2 from statistics but not the first part. If it is not the case, then what is the reason for the last statement to be 0? In the problem statement, I think "zero mean of the noise" is a given condition? I still don't understand why "eq1" leads to zero. I know that e_i and e_j are zero mean independent variables. However, H_ij is dependent on both e_i and e_j,, so I don't know how to prove that the sum of H_ij*e_i*e_j has an expected value of zero. Is it because the noise is generated independently for each datapoint?